Tethering your laptop and phone can be a bit of a hassle. Google’s Chrome OS has long offered a solution called Instant Tethering that makes the process automatic, but so far, this only worked for a small set of Google’s own Chromebooks and phones, starting with the Nexus 6. Now Google is officially bringing this feature to a wider range of devices after testing it behind a Chrome OS flag for a few weeks. With this, Instant Tethering is now available on an additional 15 Chromebooks and more than 30 phones. The promise of Instant Tether is pretty straightforward. Instead of having to turn on the hotspot feature on your phone and then manually connecting to the hotspot from your device (and hopefully remembering to turn it off when you are done), this feature lets you do this once during the setup process and then, when the Chromebook doesn’t have access to a Wi-Fi network, it’ll simply create a connection to your phone with a single click. If you’re not using the connection for more than 10 minutes, it’ll also automatically turn off the hotspot feature on the phone, too. Tethering, of course, counts against your cell plan’s monthly data allotment (and even most “unlimited” plans only feature a limited number of GB for tethering), so keep that in mind if you decide to turn on this feature. 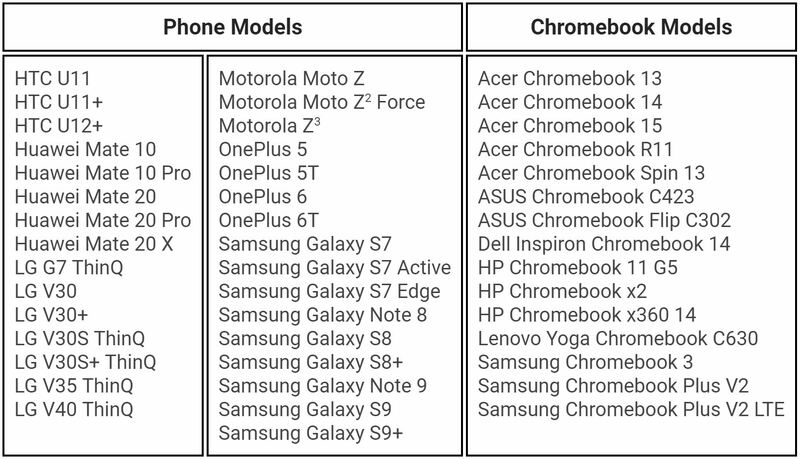 You can find the full list of newly supported devices, which include many of today’s most popular Android phones and Chromebooks, below.